Having progressed in the FA Cup seven days earlier, Knaresborough Town exited the FA Vase at the first hurdle despite making the perfect start at Billingham Synthonia. Paul Stansfield's men took an early lead against their Northern League Division Two opponents, but the hosts fought back to win Saturday's clash by a 3-1 scoreline. 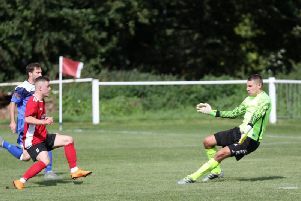 With less than a minute on the clock, Steve Bromley ran on to a long forward pass from Greg Kidd and showed good strength before firing a low shot under home goalkeeper Callum Roberts from a narrow angle. Slack Boro marking down the Billingham left was however to lead to a fourth-minute equaliser, Scott Howes running into space in the penalty area to level the score. At the other end, Josh Garbutt's volley brought a fine stop from Roberts as he pushed the ball on to his upright, and the Synthonia keeper then saved a Rob Worrall free-kick, followed by another Worrall effort from Brad Walker’s centre. The sides went into the break on terms, but Billingham edged ahead in the 47th minute when winger Matthew Wilson cut inside and fired a shot from distance into the top corner. Kallum Hannah then broke free for the home side only to see Liam Corbett save his strike before Rob Youhill fired wide for Boro. The third Synthonia goal then arrived on the hour-mark as substitute Clark Reader went clear down the right and crossed for Howes to control and place home his second of the afternoon. Walker’s shot was deflected wide as Boro tried to get themselves back in the contest, but then Reader nodded wide from a good position at the other end. Visiting defender Sam Cook saw an effort from distance pushed wide by Roberts and Walker’s next shot from Youhill’s centre was also kept out before a late Rob Worrall cross-shot was headed from the line by Jordan Jaques as the home side held out.